Expect unusual fun as Mlanjeni Magical Theater offers a form of east African theater which we call "Muungamano." It is one of Africa's interdisciplinary art-forms utilizing acting along with puppets, magical illusions, folk music and dance in traditional storytelling. The audiences are actively involved in the presentations through call-and-response singing, dancing and volunteer assistants. Presented by African storyteller-magician Mlanjeni son, the Amazing Mr. Q (together or as solo artists), the shows are a delight for pre-schools, elementary and middle schools, libraries, festivals and family-oriented events. We had Mlanjeni Magical Theater at our Easter Egg Hunt and we received an excellent performance. They were prompt and engaging. There were over 70+ children at our venue, and each one had a smile on their face as a result of interactions with the presentation. 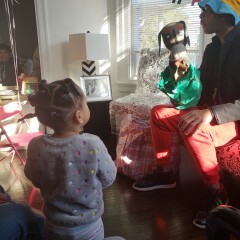 The services rendered unto us was balloon twisting and a puppet show. We can't wait to rebook them! This was an amazing show for our kids. We loved the songs, stories, puppets, and magic. He really was good with all the children and we will definitely invite him back! We had booked for a school assembly for Read Across America. Our students absolutely loved it. Initially we were concerned if it would be age appropriate for our oldest students, but our worries were eased and rightfully so! There were many call and responses, and lots of opportunity for the students to get up and interact with the story. It was an experience that they raved about and will remember for many years to come! The crowd went wild! We got rave reviews. Would reccomend to any one. Thank you! He was just ok. Wanted something a little more uplifting. Yes, I agree with this sponsor, the performance was "Just Okay"....however, the event was quite different from what was requested. I try to emphasize to clients that we are griots, and our performances are created to match the group and event. The initial request was for a storyteller for a senior center's "Worship Event" for 25 seniors. In speaking to the client, she explained that she actually wanted a program on "Health: Mind, Body and Soul." The seniors are "religious" but that was not the desired focus. ...okay, we've done senior centers and health fairs in the past, we know how to put it together plus January is Dr. King's month, so we'll have a story there as well. We asked about the senior's mobility as our performances are storytelling in Africa's theatrical tradition, our audiences have movement and dances to perform. We were told focus on movement as some seniors may be in wheelchairs. We prepared for the event. Here's where the problems occurred. First a small room overflowing with 30 people sitting and eating at tables....where we asked for chairs only.....there was absolutely no room for movement, dance and performance. None. Two, a public event for "uplifting, religious storytelling." No. No. No. " It became clear that the sponsor did not know the seniors in attendance. Dilemma #2 -our company has guidelines about religion. We will not impose specific religious stories on public audiences... what the sponsor actually needed was "survival stories," i.e. stories on surviving "cancer," or surviving other health problems common to seniors. 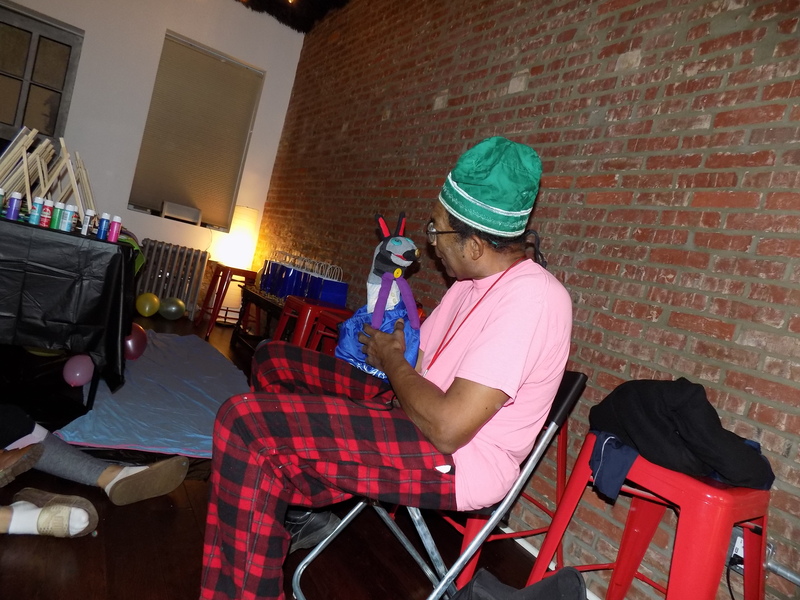 We are not seniors, hence we don't have these stories.. so "just ok"
We had a great 7th birthday party because of Mr. Q’s magic, balloon animals, and entertainment. Thank you so much! 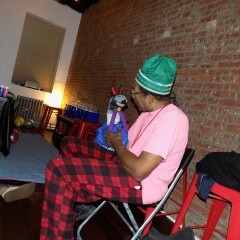 I hired Mr. Q to entertain the children at my son’s 1st birthday party. He was absolutely amazing and very funny. Even the adults enjoyed his show. I would highly recommend. My Preschool/Kindergarten scholars and staff truly enjoyed the shows. It was very interactive and engaging and I loved that he WAS the stage, the curtain, the puppets, everything. Looking forward to booking again. We hired them for 3 hours of balloon twisting. Kids absolutely loved it! Very prompt and professional. We will definitely use again! And next time maybe try some other fun activities they offer!! What a wonderful show! Thank you. The children really enjoyed the show. Mlanjeni had a fun way of keep the children engaged and the teachers laughing the whole time. I would definitely invite him back to our program. He was professional, prompt, and funny! Mlanjeni Magical Theater provided a wonderful show to our PK-3rd graders at Enrico Fermi School in Yonkers, NY. The children had a great time. They especially enjoyed the way the actors had them move around and become engaged in the show. The show was both funny and entertaining. Kids we aged 3-11 and all were laughing and had a great time. Mr. Q is awesome! The children were laughing and engaged for the entire performance. Received many compliments from parents and adult attendees. Wow! Our K-2 Kiddos Loved the Show! Mlanjeni Magical Theater came to do performances for our Literacy Night Event. They were very courteous and arrived right on time. Our students and their parents were raving about the show. Students were so engaged that they didn't even realize how much they were learning! I would highly recommend them for your event! Mlanjeni did an amazing job at our event. We had a party with children raging from 2.5 to 7 Years old and all the children plus adults loved the show. The whole room full of children were engaged the whole time and the giggles in the room never stopped from all the enjoyment! Our performance is created to match the age and attention-span of the audience. As in traditional African theater, the staging can change as the performance develops. We begin with a bag and a chair or two..... and space for activity.......the introduction begins...the audience smiles and someone points out that they don't speak the language used in the introduction. We begin again in English. We announce that we are actors and traditional storytellers visiting with a story to tell. We sit... and they laugh for nothing happens yet. We announce that we can't begin until we are greeted and welcomed into the space......with a dance from them! For young audiences... expect that this space will shrink as the performance brings the group into the actions of dancing, singing, and fun performing as magical assistants and interacting with the puppets. For older children and family audiences.... expect what we call "the murmur" followed by a collective "OOHH!" for as soon as we begin they realize that they are experiencing something different...Africa's theater!...and then the real fun begins as they begin with a traditional dance and then interact in the presentations with song, dance and activities. Talking is at a minimum with action being primary as Mlanjeni and son and/or grandson present a series of colorful magical illusions based in eastern traditions including folk music and puppets (hand masks). The introduction will vary depending on the event....but the format is similar... a "call-and-response" song and dance begin the show. The theme of the show is introduced and the storytelling begins. 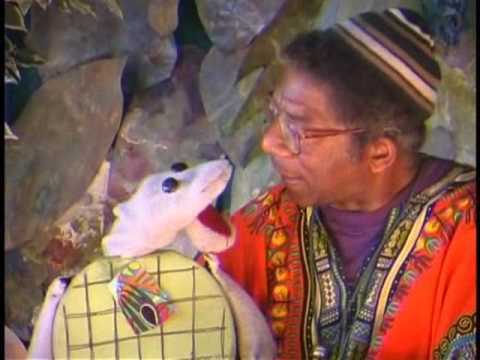 The introduction to storytelling is presented...only to be interrupted by the puppets with their event or problem of the day...the program continues in a way that's similar to a "live" television sit-com with the children drawn into the actions of the characters. Interaction is encouraged in this style of theater. Mlanjeni Magical Theater is a family act of three generations, father Mlanjeni Nduma and son, the Amazing Mr. Q and grandson Khat. The theater was started by Mlanjeni after college in 1975. He moved to the Delaware Valley in 1986 touring his "Muungamano-style" theater in schools, libraries, day care centers and museums. Joined by his son, Marquez in the 1990's, father and son perform together and as solo acts throughout the area with grandson helping out as an assistant in the magical performances, and as a balloon artist. He has been called "the cultural ambassador of fun!" A traditional storyteller (griot), Mlanjeni Nduma provides insights into Africa with his stories on ancient empires, the colonial era, and hero struggles in modern times. His stories are presented in Africa's traditional theatrical manner which includes folk music, dance, puppets (masks), magic and interactive fun. A puppeteer and ventriloquist, Mlanjeni is known for his hand puppetry and the novel staging of stories. His ventriloquist puppets are all animals and the interaction between them makes for a hilarious time for children and family audiences. Son Marquez, a/k/a the Amazing Mr. Q is recognized for his unique magic, his visual comedy in performance, and his comic storytelling of Africa's folktales. A master magician in action... his illusions vary from those normally seen in the acts of children's entertainers, and create squeals of delight and amazement from young audiences in schools, libraries and birthday parties. His programs are very interactive! 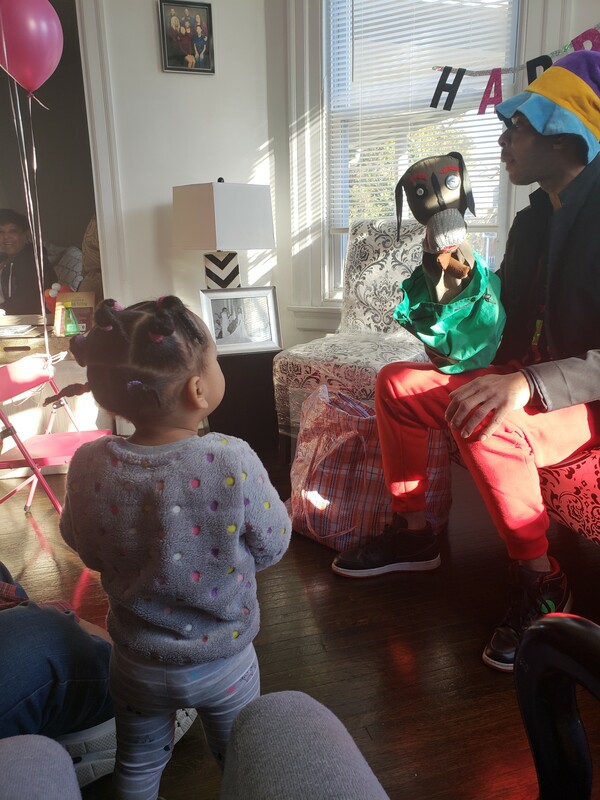 Children delight in the antics of Bow-wow the dog and Zik the rabbit, the Amazing Mr. Q's puppet assistants, as they bumble and stumble their way through the magic. Performance credits include the Philadelphia School District, the Coatesville School District, the Philadelphia Free Library, the Montgomery County Library, the Please Touch Museum, the Atlantic County Library, the African-American Museum of Philadelphia, Children's Hospital Early Head Start, Riverfest, Reading Buddies, and many of the Delaware Valley's private day care centers and private schools. We have performed in rooms as small as a hospital room with two patients (Children's Hospital of Phila. going room to room with a mini-performance) on up to a 400 seat school auditorium ( a high school performance). We have performed outside and "in-the-round." For large groups of over one hundred, a sound system is required. We can provide our own, but we prefer a tested sound system that may already have the speakers mounted in place for best acoustics. We will bring a keyboard if there is no piano. The Disney Corporation and their philosophy of positive age-appropriate entertainment for young audiences.